- Mid-South Superdome Extravaganza (April 1, '78) = Orndorff took down the Brute. - Mid-South Superdome Extravaganza (July 22, '78) = Orndorff stayed the North American Champion with a win over Bruiser Brody. - AWA/WWWF Title Unification (March 25, '79) = Orndorff & Jimmy Snuka retained the NWA Tag-Team Titles, defeating Ken Patera & John Studd. - Mid-South Superdome Extravaganza (July 21, '79) = Orndorff fell to Angelo Mosca. - Mid-South Superdome Extravaganza (August 2, '80) = Orndorff defeated Ken Mantell. - Mid-South Superdome Extravaganza (November 27, '80) = Orndorff lost a "Lights Out" Match to Ernie Ladd. - Mid-South Superdome Extravaganza (July 4, '81) = Orndorff won the North American Title from Jake Roberts. Later on, Orndorff lost a "Lights Out" Match to the Junkyard Dog. - Mid-South Superdome Extravaganza (November 26, '81) = Orndorff & Bob Orton Jr lost to the Mid-South Tag-Team Champs, Mike George & the Junkyard Dog. - Mid-South Superdome Extravaganza (May 1, '82) = Orndorff lost a "Taped Fist" Match to the North American Champ, Bob Roop. - NWA/WWF World Title Unification (July 4, '82) = Orndorff retained the National Championship, winning, via DQ, over Jimmy Snuka. - NJPW Sumo Hall (April 21, '83) = Orndorff was beaten by Akira Maeda. 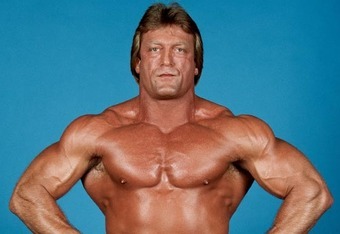 - NJPW Sumo Hall (November 3, '83) = Orndorff won over Masanobu Kurisu. - WWF The Brawl To Settle It All (July 23, '84) = In a dark match, Orndorff beat Chief Jay Strongbow. - WWF The War To Settle The Score (February 18, '85) = Orndorff won over Tony Atlas. 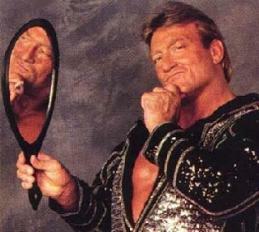 - WWF Wrestlemania I (March 31, '85) = Orndorff & Roddy Piper fell to Hulk Hogan & Mr. T.
- WWF Ohio State Fair Show (August 13, '85) = Orndorff beat the Iron Sheik. 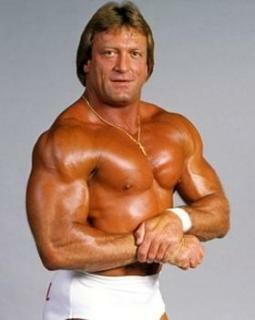 - WWF Saturday Night's Main Event #2 (October 3, '85) = Orndorff fought to a Double Count-Out with Roddy Piper. - WWF The Wrestling Classic (November 7, '85) = Orndorff won, via DQ, over Bob Orton Jr. Later on, Orndorff fought to a Double Count-Out with Tito Santana. The Junkyard Dog went on to win the Wrestling Classic Tournament. - WWF Wrestlemania II (April 5, '86) = Orndorff fought to a Double Count-out with Don Muraco. - WWF Saturday Night's Main Event #6 (May 1, '86) = Orndorff lost, via DQ, to Adrian Adonis. - WWF The Big Event (August 28, '86) = Orndorff lost, via DQ, to the WWF World Heavyweight Champion, Hulk Hogan. - WWF Saturday Night's Main Event #7 (September 13, '86) = Orndorff again lost, via DQ, to the WWF World Champ, Hulk Hogan. - WWF Saturday Night's Main Event #9 (December 14, '86) = Orndorff lost a "Steel Cage" Match to the WWF World Champion, Hulk Hogan. This was the match that had to be restared after both wrestlers escaped the cage at the exact same time. 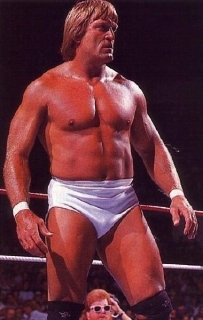 - WWF Saturday Night's Main Event #10 (February 21, '87) = Orndorff competed in a "Battle Royal", which was won by Hercules. - WWF Saturday Night's Main Event #12 (September 23, '87) = Orndorff was pinned by King Kong Bundy. - WWF Survivor Series '87 (November 26) = Orndorff, Hulk Hogan, Bam-Bam Bigelow, Don Muraco, & Ken Patera fought in an "Elimination" Match against Andre the Giant, King Kong Bundy, Butch Reed, Rick Rude, & the One Man Gang. Orndorff was eliminated by Rude. Andre was the sole 'survivor'. - TSWA Spring Spectacular (March 31, '90) = Orndorff defeated Austin Idol. - TSWA Summer Sizzler (June 9, '90) = Orndorff took down Tully Blanchard. - WCW Clash of the Champions XI (June 13, '90) = Orndorff pinned Arn Anderson. - WCW Great American Bash '90 (July 7) = Orndorff, El Gigante, & the Junkyard Dog won, via DQ, over Arn Anderson, Sid Vicious, & Barry Windham. - TSWA Spring Spectacular II (May 18, '91) = Orndorff won, via DQ, over Rick Rude. - SMW Volunteer Slam '92 (May 22) = Orndorff pinned Tim Horner and Robert Gibson, but lost, via DQ, in the finals of the SMW Heavyweight Title Tournament to Brian Lee. - SMW Fire On The Mountain '92 (August 8) = Orndorff lost a "Piledriver" Match to Ronnie Garvin. - WCW Clash of the Champions XXII (January 13, '93) = Orndorff, Barry Windham, & Big Van Vader lost a "Thunderdome Cage" Match to Dustin Rhodes, Cactus Jack, & Sting. - WCW Superbrawl III (February 21, '93) = Orndorff lost a "Falls Count Anywhere" Match to Cactus Jack. - WCW World Television Title Tournament (February/March '93) = Orndorff took down Too Cold Scorpio, Cactus Jack, Johnny B. Badd, and Erik Watts to win the tournament. - WCW Slamboree '93 (May 23) = Orndorff & Rick Rude defeated Dustin Rhodes & Kensuke Sasaki. - WCW Beach Blast '93 (July 18) = Orndorff stayed the World Television Champion, winning, via DQ, over Ron Simmons. - WCW Clash of the Champions XXIV (August 18, '93) = Orndorff lost the World Television Title to Ricky Steamboat. - WCW Fall Brawl '93 (September 19) = Orndorff & the Equalizer were beaten by Marcus Bagwell & Too Cold Scorpio. - WCW Halloween Havoc '93 (October 24) = Orndorff won, via countout, over Ricky Steamboat. - WCW Clash of the Champions XXV (November 10, '93) = Orndorff lost to the WCW United States Champion, Dustin Rhodes. 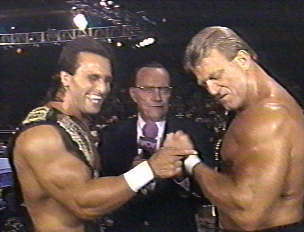 - WCW Battle Bowl (November 20, '93) = Orndorff & the Shockmaster beat Ricky Steamboat & Steven Regal. Later on, Orndorff competed in the "Winners Battle Royal", which was won by Vader. - WCW Starrcade '93 (December 27) = Pretty Wonderful (Orndorff & Paul Roma) defeated Marcus Bagwell & Too Cold Scorpio. - WCW Clash of the Champions XXVI (January 27, '94) = Pretty Wonderful fell to Marcus Bagwell & Too Cold Scorpio. - WCW Superbrawl IV (February 20, '94) = Orndorff, Rick Rude, & Steve Austin lost a "Thunderdome Cage" Match to Dustin Rhodes, Brian Pillman, & Sting. - WCW European Cup Tournament (March '94) = Orndorff lost in the first round to Cactus Jack. Sting won the tournament. - WCW Slamboree '94 (May 22) = In a dark match, Pretty Wonderful beat Brian & Brad Armstrong. - WCW Bash At The Beach '94 (July 17) = Pretty Wonderful won the WCW Tag-Team Titles, taking down Kevin Sullivan & Cactus Jack. - WCW Clash of the Champions XXVIII (August 28, '94) = Pretty Wonderful was beaten by the Nasty Boys. - WCW Fall Brawl '94 (September 18) = Pretty Wonderful retained the WCW World Tag Titles, defeating Stars 'n' Stripes. - WCW Halloween Havoc '94 (October 23) = Pretty Wonderful won the WCW World Tag-Team Titles from Stars 'n' Stripes. - WCW Clash of the Champions XXIX (November 16, '94) = Pretty Wondeful dropped the WCW World Tag Titles to Stars 'n' Stripes. - WCW Superbrawl V (February 19, '95) = In a dark match, Orndorff defeated Brad Armstrong. - WCW United States Heavyweight Title Tournament (April/June '95) = Orndorff beat Johnny B. Badd, then fell to the eventual winner, Sting. - WCW Slamboree '95 (May 21) = Orndorff lost to the NJPW IWGP Champion, the Great Muta. - WCW Bash At The Beach '95 (July 16) = Orndorff lost to the WCW Television Champ, the Renegade. - WCW Clash of the Champions XXXI (August 4, '95) = Orndorff again fell to the WCW Television Champion, the Renegade. - WCW Halloween Havoc '95 (October 29) = In a dark match, Orndorff pinned the Renegade. - WCW World War III '95 (November 26) = Orndorff competed in the "WWIII Three-Ring 60 Man Battle Royal", which was won by Randy Savage. - WCW Fall Brawl '00 (September 17) = Orndorff, Rey Mysterio Jr, Juventud Guerrera, Big Vito, Disco Inferno, Konnan, & Tygress fought in an "Elimination" Match against Mike Sanders, Chuck Palumbo, Mark Jindrak, Sean O'Haire, Sean Stasiak, Reno, & Johnny the Bull. The match ended in a No-Contest when Orndorff was injured after a piledriver attempt.